Vandy Vape Maze Sub Ohm BF RDA Review - Daily Vaping Deals & The Best Vape Product Reviews at Vaping Cheap! Vandy Vape has released a lot of good products in 2017, and in 2018 they’re releasing something quite innovative and different, the Maze Sub Ohm BF RDA. While it’s not a traditional RDA, it aims to provide the vaper with an RDA experience without actually needing to build coils. This is great for both the beginner and advanced vaper, and it’s always a good thing to see something different being released to the fast paced vape market. Before getting any further we’d like to thank MyVpro and Vandy Vape for sending this RDA atomizer for the purposes of this review. 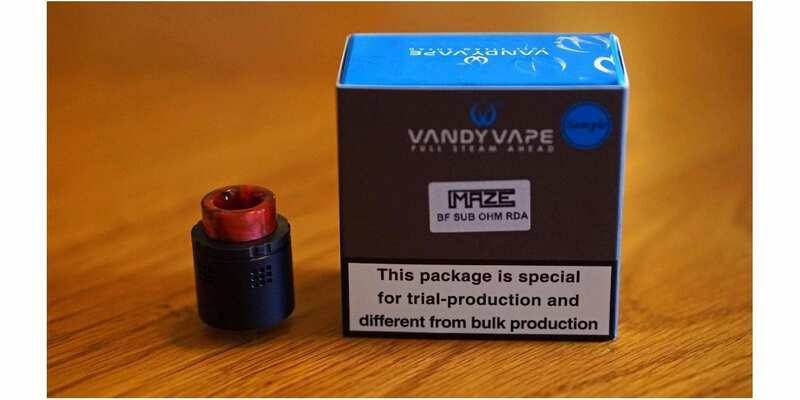 We’ll cover our first impressions, usage, performance, pros and cons, and conclude with whether or not we recommend the Vandy Vape Maze Sub Ohm BF RDA! Purchase Here! Visit Vandy Vape Here! Click Here to Check Out the Maze Sub Ohm BF RDA by Vandy Vape! The Maze Sub Ohm BF RDA we received came in the usual trail packaging Vandy Vape sends, so there’s not much to cover in that aspect. However, going by Vandy Vape’s previous retail packaging, they’re always top notch and keeps everything secure while in transit. The color I received is the Matte Black, but there are other colors to choose from including stainless steel, gold and the ever so popular rainbow. Once you slide open the packaging, you’re immediately met with the Maze Sub Ohm BF RDA and a replacement coil disc. Underneath it is where is all of the included accessories such as a 510 drip tip adapter, spare o-rings, hex key driver, standard 510 pin and refill tube. The matte black finish is really nice, and the included resin 810 drip tip is definitely a bonus. I do like that companies are now including resin or acrylic drip tips, this is always a pro for me. The Maze is about standard height when comparing it to other 24mm RDAs. It’s not very short nor is it tall, it’s a good height in my opinion. This atomizer does come pre-installed with a squonk or BF 510 pin, which was probably something I wasn’t going to remove due its design and how it operates. One 0.2 ohm disc is pre-installed already when you receive the Maze, and it’s very easy to unscrew and screw back into place. 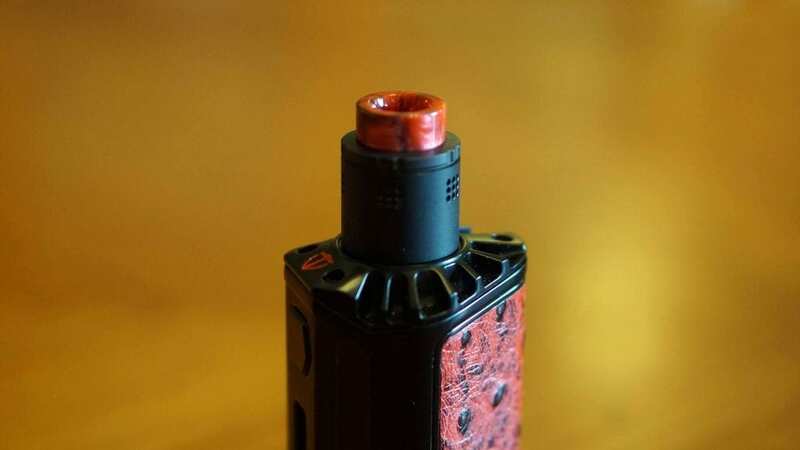 The Maze coils have cotton on both the top and bottom areas, but the bottom is more “open” to have ejuice wick more efficiently. This is how you know which side goes face down when installing the coil. The top part has somewhat of a mesh kind of look, but you can drip e-liquid onto it and it’ll seep into the cotton as well. I’ll cover this more into detail later. Something I did notice right away is the amount of airflow this atomizer has. It has 5 different airflow slots with each slot having 9 small airflow holes. They are fully adjustable, and whenever you adjust it, all the airflow holes are adjusted the same. This design does remind me of the Bonza RDA from Vandy Vape, and going by how that vapes, it’s incredibly smooth. I do want to mention that the airflow is angled downwards, so it hits the coil then goes up through the drip tip. Overall, my first impressions of the Vandy Vape Sub Ohm BF RDA was great! I liked the overall design, and was excited to see how these Maze coils or discs performed! Using the Maze Sub Ohm BF RDA by Vandy Vape is pretty straight forward. Like mentioned previously, there’s no building involved as it provides you with coils that are easy to install. To insert a coil, simply unscrew one if there’s one present, and screw the new one into place. Before doing this though, I like to prime it with some e-liquid beforehand to help get it started. This is something I do with pretty much any pre-built coil. You can drip e-liquid down the center, but that’s not something I’d recommend, especially when it’s filled with ejuice. Sometimes, the e-liquid can sit there and not saturate properly if there’s already e-liquid present. Of course, as you vape it’ll saturate, but the best I’ve found is just to prime it first with e-liquid, then simply fill the tank section underneath. For me, there’s no need to drip e-liquid down the center of your drip tip with this one. Adjusting the airflow is also easy, and all of the o-ring tolerances are great. To adjust the airflow, simply turn the top piece, and whatever is adjusted to one airflow, will be the same for all of the others. Since this atomizer does include a resin 810 drip tip, and a 510 drip tip adapter, you can pretty much use any of your preferred drip tips, which is always a pro! Honestly, I liked the one it came with as I thought it not only looked great, but it was comfortable too. As mentioned in the first impressions, the Maze comes with a pre-installed squonk pin, but it does include a standard 510 pin. To replace the 510 pin, simply unscrew the coil, then unscrew the squonk pin and refill tube. After you’re finished doing that, simply install the 510 pin alongside the refill tube (included in the spare bag) and reinsert the Maze coil. You want to use the refill tube with the standard 510 pin, because it has a juice fill port at the top which you will use to refill the tank reservoir. Honestly, I’ve been using this with a squonk mod as I find this is where it shines, and makes it very easy to refill. 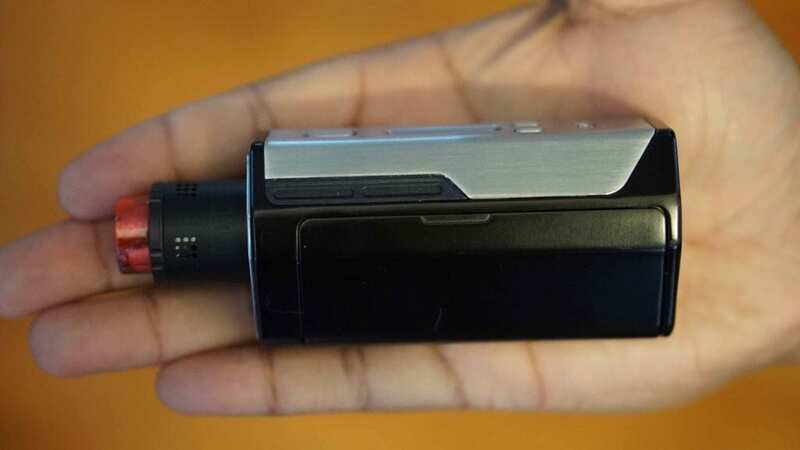 I do like the fact that it does include a spare standard 510 pin and refill tube for the vapers who don’t have a squonk vape mod or simply wanted to use a different box mod. This is definitely a pro in my book! Overall, using the Vandy Vape Maze Sub Ohm BF RDA is quite easy, and I’m sure the beginner and advanced user will have no issues. Replacing the 510 pins is relatively quick, and inserting the Maze coil is pretty similar to that of a sub ohm tank. Now the biggest question of this vape review is how does this atomizer perform? Well, I must say it performed better that what I originally expected! Now, with pre-built coil heads which we see primarily in sub ohm tanks generally give off good flavor, but we wouldn’t say as good as say an RTA or traditional RDA. The Maze actually has really good flavor, and definitely better than some of the sub ohm tanks we’ve recently reviewed. It’s not the best flavor in the world, but it’s comparable to that of an RTA I’d say, which is pretty good when considering it’s from a pre-built coil head. These coils are rated up to 100w, but are best vaped between 70w and 80w. I found this to be quite accurate as my preferred wattage to vape these coils were between 65w and 80w. I would get a warm and saturated vape experience every time I took a vape. You do receive two 0.2 ohm Maze coils. If you’re worried about these coils wicking with the juice reservoir, fear not. I’ve never experienced a dry hit or even close to a dry hit with the Maze Sub Ohm BF RDA. When you’re vaping, you’re also tilting the atomizer at an angle, and every time you do so, you’re feeding e-liquid to the coil. If you’re wanting to make sure they’re fully saturated, you can always turn your mod upside down while the atomizer is attached. The tank reservoir does have an ejuice capacity of 2ml, which is decent. Depending on how much you vape will determine how much you need to either squonk or fill it. I found on average, I’d need to fill it about every two hours if I wasn’t chain vaping. If I were chain vaping, then I could easily blow through the entire tank in just under an hour. Some might the e-liquid capacity as a con, but with squonking, it’s not really since you can simply squeeze or push your squonk bottle, and it’s filled. When do squonk it, all of the excess e-liquid does get drained right back into your squonk bottle. The airflow is nice and smooth as expected with the Maze. However, when it’s wide open, there’s just way too much airflow in my opinion and it does hinder the flavor. I found myself closing it off about half way to add some restriction to the vape, and it does help with the flavor tremendously. If you like a very airy vape, then you’d probably enjoy this atomizer wide open. I do want to mention that I occasionally had some spit back occur. It wasn’t very often, but it happened often enough where I’ll mention it as a con. Overall, the performance of the Vandy Vape Maze Sub Ohm BF RDA was pretty good! The coils were always saturated while vaping, and the flavor was a bit better than what I originally expected! In conclusion, the Vandy Vape Maze BF Sub Ohm RDA is a great performing atomizer that offers RDA like performance without needing to actually build your own coils. I think it’s great that Vandy Vape released something different going into 2018, and while it’s not for everyone, I do think there are some vapers that’ll really benefit from this atomizer. There were some cons to be mentioned, the first was the spit back I experienced. It wasn’t too bad, but like said before, it happened enough to me where I find it as a con. 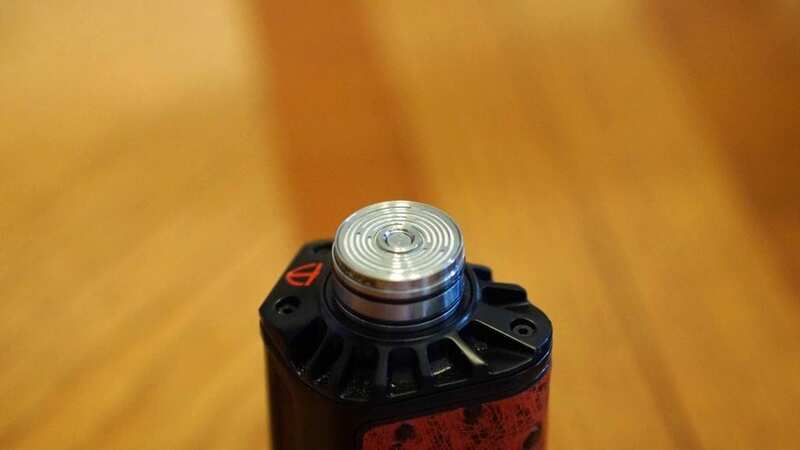 For it not being rebuildable is subjective, as it is called an RDA and it’s not able to be rebuilt. I know some vapers may be confused with the name, but it’s the name they went with. I personally don’t think it’s a huge deal, but something to mention. Lastly, with the airflow wide open, the flavor isn’t the best. This was expected, but for the vaper who just wants wide open airflow, they’d be satisfied with it. Overall, I think Vandy Vape did a good job with this one. I don’t think the Maze is for everyone, but I do think it’s a great option to have. For the vaper who’s new or simply not able to build coils, this is an excellent atomizer to have if they’re wanting to have that RDA experience. If that’s something you’re looking for, I can definitely recommend the Maze BF Sub Ohm RDA by Vandy Vape! For under $30, I think it’s a great buy. We hope you find this review helpful in finding the right atomizer to fit all of your vaping needs! Feel free to leave any questions or comments down below! Thanks for reading!